College life is full of essays – there is no escaping that. You will be asked, depending on the type of classes you take, to write a variety of essays. Today, you are reading this because your professor has asked you to write a narrative essay, and you are probably struggling to get started. But with the proper steps, you can easily be on your way to crafting a stellar narrative essay that will be a joy to read by your professor and earn you high marks. But before we get into the tips, let us talk a little more about what a narrative essay is and its format. A narrative essay tells a story about an experience, interaction or event that happened to a particular person. In a majority of cases, the person being written about is usually yourself – the author. It is not just about telling a story but telling it in a way that is vivid and interesting in order to draw in readers. On top of that, it also needs to have a coherent and factual plot. You might be wondering why this might sound like a personal essay on some level, but the two are completely different. For one, in a personal essay, there is no plot, and if there is a plot, it is a vague one. Each type of essay you write in college is different and therefore has different requirements. Here, you will need to adopt a narrative format. So if you want to make it as good as possible, pay attention to the following tips to stay consistent with the narrative format. Your narrative essay should have characters, a plot, setting, a climax, and a conclusion. Keep in mind that you are telling a story here, meaning that all the elements of a good story should be included. You should aim to write your narrative essay in the first-person perspective (using “I” statements). This will help build a consistent point of view (do not switch between perspectives) and better engage your readers. Details must be vivid, meaning you must show, not tell. Anything, no matter how mundane, can be made more exciting to read if it is explained with vivid detail, whether it is an office chair or a feeling. This will also make the reader feel as they are a part of the story. 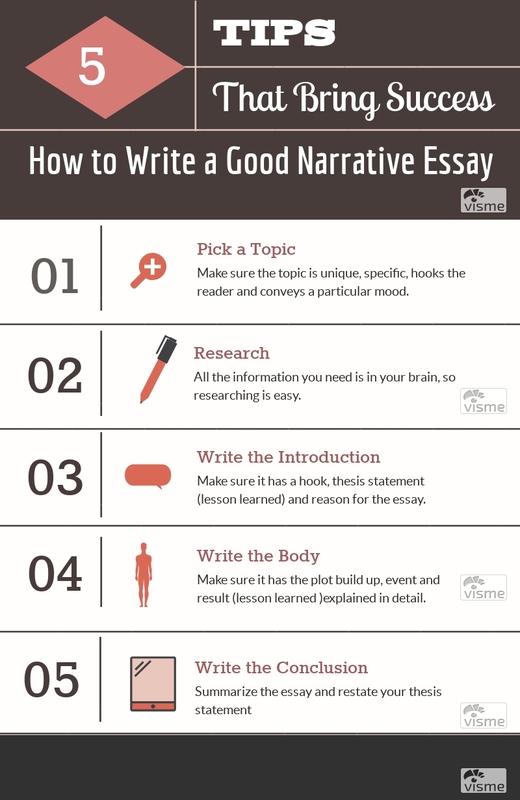 You should also make sure that your narrative essay is well-structured. This means it should have a clear outline that includes an introduction, body, and conclusion. The previous sections were a primer to get you familiar with a narrative essay. Now, we will give you five tips that will bring you success when you actually start writing. Picking a topic is an extremely important step. So you need to sit down and brainstorm a topic that is important to both you and the reader. Since the experience, interaction or event you will be telling a story about is usually something from your own life, coming up with a topic should not be an extremely difficult task. Just make sure that it is unique (it cannot be found anywhere on the Internet), specific rather than general, hooks the reader in and conveys a particular mood. The good thing about writing a narrative essay is that you do not need to spend countless hours on the web researching the topic. All the information you need to build a good narrative is in your brain, from the stories about yourself that you have accumulated throughout the years. When you start writing, just let the content flow from your mind naturally. If some of the details are a bit hazy, you can ask someone who was there to help you recall the event so your essay is as factual as possible. Hook. The hook is usually a sentence or two meant to grab the reader’s attention. This is what will make the reader decide whether they should continue reading your essay or not. Thesis statement. The thesis statement is another sentence or two that tells the reader what the whole essay is about (the lesson learned or narrative). The significance of the essay. This is the reason why the reader should be reading your essay. The plot. Tell the reader the moments that led up to the event. This means you must tell them everything they need from the beginning so they can follow the plot such as the setting, important people involved, feelings, and observations. The event. Try as much as possible to recreate the event so that the reader feels as if they were actually there. This means you should use descriptive phrases and words. Remember to show the reader, rather than just telling them. The result. Tell the reader the lesson you learned. Make it clear that you are ending the story, and try as much as possible to answer any question that the reader might have. 5. How to Write a Narrative Essay Conclusion. Summarize the essay. This means restating the major points of the essay without being too redundant. Restate your thesis statement. Even though you already said it in the introduction, do not just copy and paste it from there. Just make sure it is restated in a way the ties into the rest of the essay, especially the result (lesson learned).